When Krell attacks with his Hatchet Throw Special Attack, he may attack one additional time. Krell rolls an additional die when attacking or defending against large or huge figures. If Krell begins its turn unengaged, add 2 to its Move value this turn. If it Krell begins its turn engaged, add 2 to its Attack value this turn. 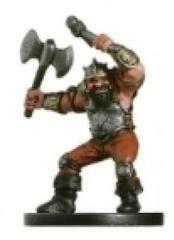 The figure used for this unit is Anvil of Thunder from Auggies Wizards of the Coast D&D Set. The name and model number is Anvil of Thunder Aberations #002. Instead of attacking, you may choose 1 small or medium figure within 4 clear sight spaces of Abyss. The figure will be swallowed no matter what. If the figure was engaged, they will take no leaving engagement attacks. After moving and before attacking, you may Regurgitate on any space, even if the space is occupied and you can use the swallowed figure as ammunition against any opponent's figure. If you did that, each figure will take 1 wound. If the figure on the space still lives you may place the figure that was Regurgitate adjacent to the space if the swallow figures isn't destroyed. Abyss does not have to stop movement when entering water spaces. The figure used for this unit is Giant Leech from Auggies Various pathfinder D&D Set. The name and model number is Giant Leech Jungle of Despair. Last edited by Heroscaper 101; June 13th, 2018 at 06:58 PM. I'd try testing Abyss at 190 at least. It has strictly better life and defense and an extra ability. Your triggers on Swallow/Regurgitate are a bit... weird lol You never want to force players to remember something as simple as whether they took one or two damage, cause it can lead to a lot of feel-bad moments. Also, is your intent that the swallowed figure gets put on Abyss' Army Card? And which figure is taking the extra damage? Honestly if you broke Swallow and Regurgitate down into two separate powers and dropped Coil Crush, you'd have a pretty sweet card for 170-210 points. Swallow causes no damage on its own, but you can still swallow small or medium figures. Regurgitate can be used to put the figure in a lava space or use the swallowed figure on the opponent's figure causing 1 wound each. The Swallow & Regurgitate was inspired from the sand worm in Final Fantasy series. Heroscape has Wo-Sa-Ga, then the custom worm and why not a worm with the Swallow & Regurgitate abilities. When you roll attack dice for any attack made by Malice, you may re-roll all attack dice that did not show skulls. Critical Strike Chance can be used only once for each attack roll. When Malice roll defense dice for any non-adjacent attack, you may re-roll all defense dice that did not show shields. All excess shields count as unblockable hits on the attacking figure. When rolling attack dice against any figure, if Malice rolls a skull on every die, the defending figure cannot roll defense dice. Killing Edge does not affect destructible objects. 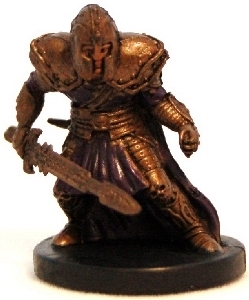 The figure used for this unit is Zhentarim Champion from Auggies Various pathfinder D&D Set. The name and model number is Zhentarim Champion Lords of Madness #059. Last edited by Heroscaper 101; June 25th, 2018 at 11:20 AM. Malice is actually pretty good ability wise. Probably just tweak his move down to a move of 6 and his health down to seven health and just make him cost 200 points and I think that'd be good. Each time Death Knight destroys a figure, you may remove a wound marker from this Army Card. Death Knight cannot Life Drain Destructible Objects. Figures attacked by Death Knight subtract two from their defense dice. Destructible Objects are not affected by Soul Weapons. Add 1 to Death Knight' attack dice for every Undead Knight you control within 4 clear sight spaces of Death Knight up to a maximum of +5 dice. The figure used for this unit is Death Knight (Dragonborn Paladin) from Auggies Wizards of the Coast D&D Set. The name and model number is Death Knight (Dragonborn Paladin) Savage Encounters #010. Last edited by Heroscaper 101; September 11th, 2018 at 08:27 PM. Last edited by Heroscaper 101; September 11th, 2018 at 08:28 PM. Range 5. Lob 12. Attack 2. Choose a figure to attack. No clear line of sight is needed. Any figures adjacent to the chosen figure are also affected by Grenade Special Attack. Roll attack dice once for all affected figures. Each figure rolls defense dice separately. After moving and before attacking, roll the 20-sided die for extra damage. This affects the Grenade Special Attack for this figure. If you roll 1-4, your Grenade Special Attack is a Poison Gas Grenade and it does 1 damage on contact, the poison ignores all shields, so roll for this Grenade Special Attack. If you roll 5-11, your Grenade Special Attack is a Napalm Grenade and each skull rolled counts for one additional hit. If you roll 12-19, your Grenade Special Attack is a Thunder Grenade and that figure has any or all defensive aura's and defensive abilities disable. If you roll a 20, your Grenade Special Attack is a Cryo Grenade and small or medium figures cannot roll any defense dice and large or huge figures roll 2 fewer defense dice. 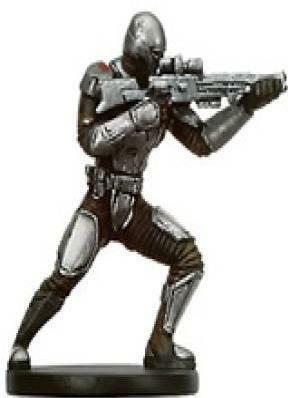 The figure used for this unit is a Star Wars figure from the Bounty Hunters set. Its model number and name is #59/60 Mandalorian Supercommando. Last edited by Heroscaper 101; July 18th, 2018 at 03:53 PM. When Dvorak Guy attacks, he may attack one additional time. At the start of the game, put 5 elemental markers of Dvorak Guy Army Card. Remove the elemental marker, after using elemental bullets. At the end of round, place the 5 markers on Dvorak Guy Army Card. Add 1 additional attack dice for the element marker you are using and all 5 markers for Chaos damage. Before moving, roll the 20-sided die. If you roll 1-4, use the earth bullet marker and each skull rolled counts for one additional hit. If you roll 5-7, use the fire bullet marker and inflict burn damage, the defending figure takes 1 wound of burning damage if they don't end their movement in water. If you roll 8-11, use the ice bullet marker and the defending figure rolls 2 lesser shields. If you roll 12-19, use the lighting bullet marker and the defending figure cannot roll any shields. If you roll a 20, use all elemental markers to attack. 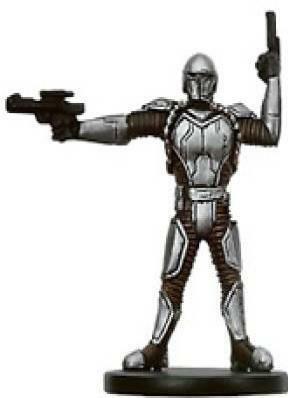 The figure used for this unit is a Star Wars figure from the Bounty Hunters set. Its model number and name is #58/60 Mandalorian Soldier. After attacking an opponent's Common figure with Dorian's normal attack, roll 1 attack die for fire damage each wound inflicted in that attack. For each additional skull rolled, place 1 additional wound Marker on the defending figure's Army Card. When rolling defense dice, if Dorian rolls at least one shield, the most wounds Dorian may take for this attack is one. If Dorian has 3 or more wounds on his Army Card, if the defending figure is Unique, they roll 3 lesser defense dice. It was peaceful in the forests of Eberron. The monk Dorian was meditating in the tranquil forest until there was a disturbance in the forest. There was fire all around Dorian and before he die there was a strange light that teleported Dorian to Valhalla. When the monk finished meditating and Dorian open his eyes to see that the forest was gone. He found out that his tranquil moments were gone and Dorian started to fight the enemy to bring peace to Valhalla. 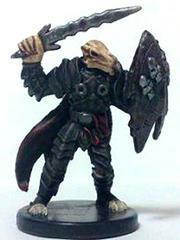 The figure used for this unit is Tanuki from Auggies Various pathfinder D&D Set. The name and model number is Tanuki Jungle of Despair. Last edited by Heroscaper 101; August 8th, 2018 at 06:23 PM.